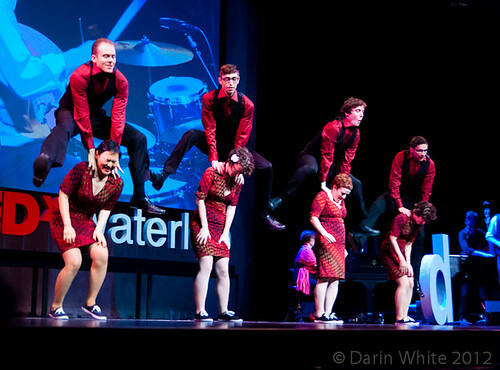 Fortunately, our show at TEDx Waterloo was a hit! The videos aren’t up yet, but will be soon. In the meantime, here’s the picture of our quantum leap. You can see some more pictures here. It was definitely the largest crowd I’d ever performed for. Nerves were affecting our dress rehearsals the night before. At one point we were practicing the aerial (tossing the girls in a backflip) and the lights cut out! In the end it all came together, though. Hopefully this will inspire people to look deeper into the physics of quantum mechanics. Maybe the image of dancers and magic will provide some sense of familiarity with these baffling ideas. Especially for those who feel more comfortable with dance than physics. Maybe we can get some domain cross-over… dancers learning physics… and physicists learning dance.